Committee for Montgomery needs YOU in order to fulfill our vision of being the County’s “shared conscience on public policy.” Connect with us and let us connect you to the issues, people, and actions that make a difference for our County and our State. Advocacy is a powerful way to exercise your rights and responsibilities as a citizen. You are not just letting elected officials know your views on issues; you are building relationships that will help you provide your elected representatives with the information they need to make responsible decisions to serve their constituencies. Advocating as a group or coalition is even more effective, and as a coalition of diverse groups and individuals, CfM is a strong voice for the people of Montgomery County. Advocacy Day is a designated time to meet with legislators as a group to reinforce year-round interaction. Watch our web site for information about the next Advocacy Day and about ongoing advocacy efforts throughout the year. Committee for Montgomery Board Members meet with Senator Nancy King (D-19) during Advocacy Day 2017. 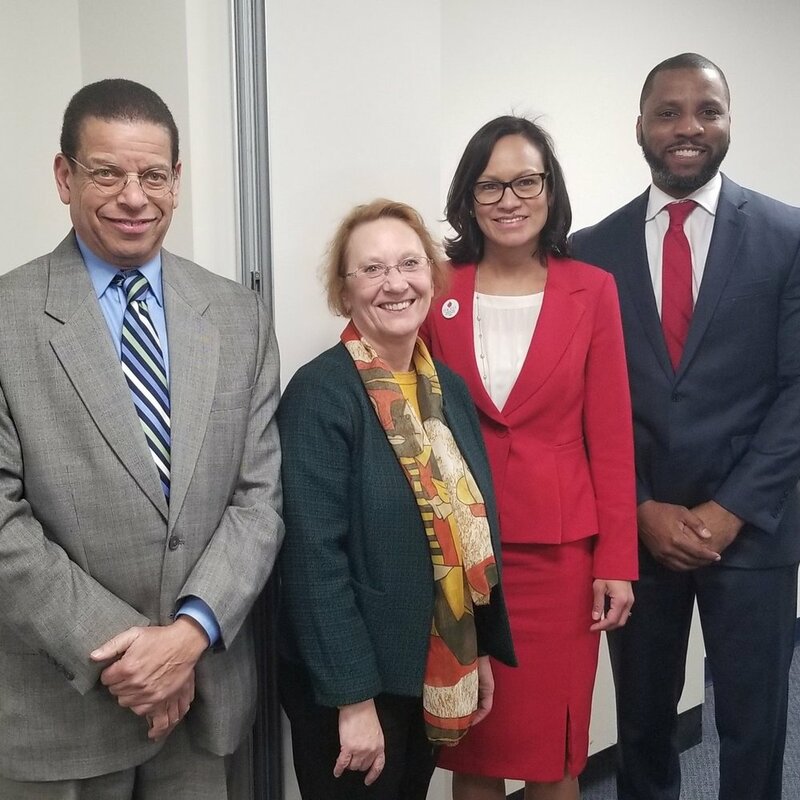 Left to right: Tina Patterson (Jade Solutions LLC), Senator King, Crystal Townsend (Healthcare Initiative Foundation), Ilaya Hopkins (Montgomery County Chamber of Commerce) and Carla Satinsky. 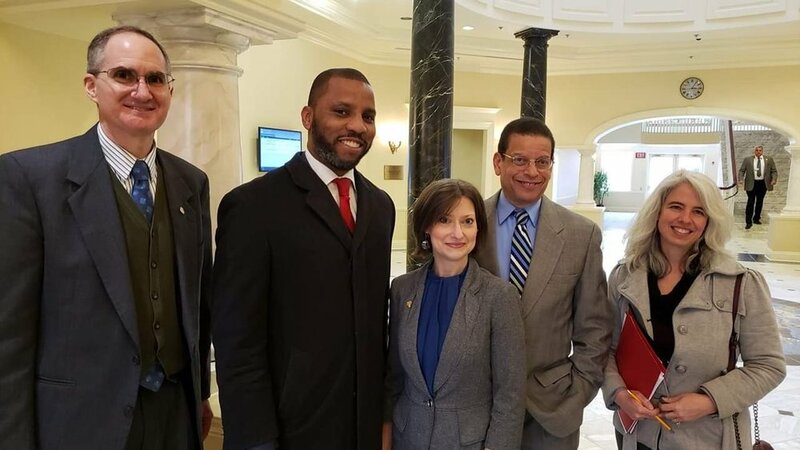 In the continuing effort to broaden awareness of the changing nature of Montgomery County and ongoing needs that require support from the State, members of the Committee for Montgomery Board of Directors attended a CfM Advocacy Day during the Maryland General Assembly Legislative Session. The attendees got an in-depth briefing of the session to date from CfM Board Member Senator Rich Madaleno who outlined some of the challenges and opportunities this session. Following the briefing, small groups set out to visit individual members of both the Senate Budget and Taxation and House Appropriations Committees to discuss Committee for Montgomery priorities. These visits included time with legislators who are not from Montgomery County. This presented an excellent opportunity to discuss in greater detail the changing nature of Montgomery County and key priorities. The day ended with a reception for CfM members to meet with members of the Montgomery County Delegation to share information and continue to work together to support the needs of the residents of Montgomery County. CfM members were present in Annapolis throughout the session at specific hearings and to follow up as a resource for more information about Montgomery County.